Canadian Wildlife Federation: Watch Out! Turtles are slow. If there’s one thing we all know about this species it’s the fact turtles tend to do things at their own speed. That’s especially true when they’re crossing the road, and that is what makes road mortality such a problem for Canada’s freshwater turtle populations. 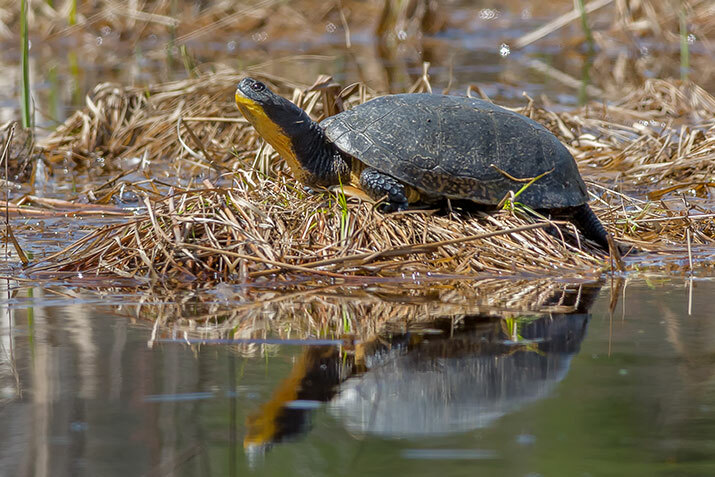 Most of the species of turtles that call Ontario home live primarily in wetlands, like marshes and swamps. And just like Shrek discovered, leaving the swamp – or the wetland – can have some unfortunate consequences. Turtles are often on the move for various reasons; they could be travelling from one wetland to another for feeding or breeding. Adult females must leave their aquatic homes to find places to lay their eggs. Juvenile turtles may venture off after hatching to find a new wetland to call home. In all of these cases, turtles frequently have to cross roads to get where they’re going. No matter what you may remember playing your Frogger video game, it’s no easy task getting across the road for a species that travels as slowly as a turtle. There’s another thing turtles do slowly, and that’s reproduce. Female turtles can take up to 20 years or more to be old enough to lay eggs, depending on the species. Given that fact, it’s easy to see why the death of one female turtle on the road can have significant impact on turtle populations. 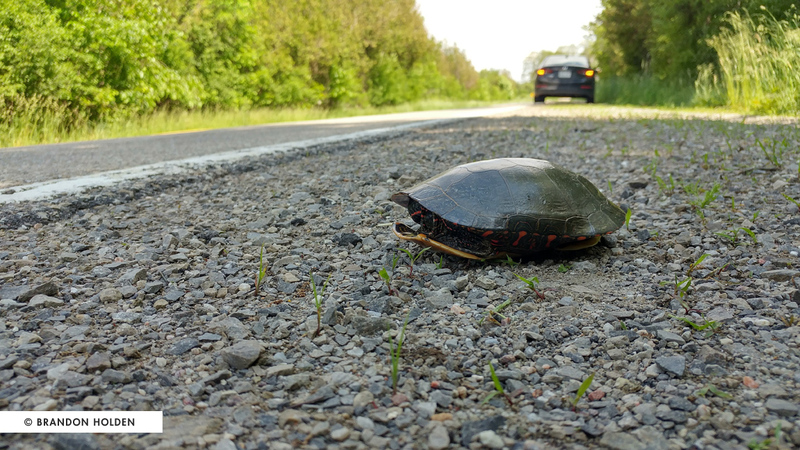 As part of our freshwater turtle recovery program, the Canadian Wildlife Federation has been conducting road surveys in various regions of Ontario to locate areas with high numbers of turtle road mortalities. During surveys conducted during spring and summer last year in Eastern Ontario, we found 548 dead turtles on roads. This is a staggering amount of road kill, one we hope to reverse with your help! When you see a turtle on the road, make sure to hit the brakes not the turtle – keeping in mind the traffic behind you of course. When you spot a turtle attempting to cross the road and you’d like to help it, please ensure your own safety first. Turn on your hazard signal and check the road for cars before you make your move. If the coast is clear, follow these instructions to move a turtle across the road this spring. You’ll want to make sure you use two hands. Grip the sides or back of shell firmly before picking up a turtle. Be aware that turtles may pee or attempt to scratch. Be careful not to drop them. Always move the turtle in the direction it’s headed. Slide the turtle onto a shovel or car mat and slide them across the road. Snappers earned their name for a reason. Be wary of the front end! Another option when dealing with a Snapping Turtle: have it bite a stick. Then drag it gently across the road. 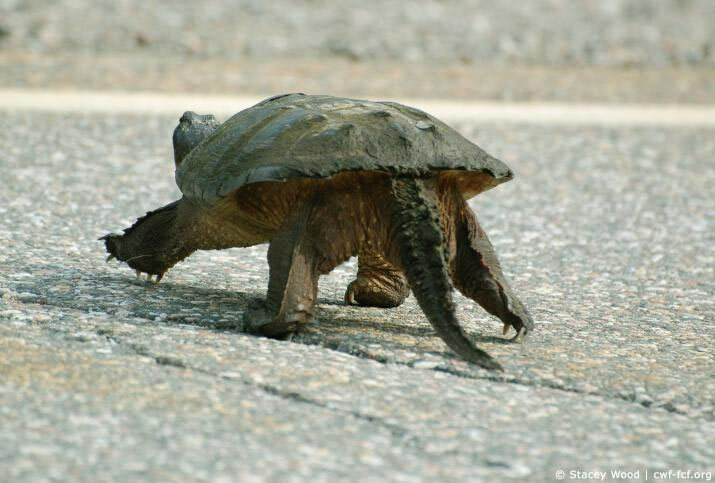 NEVER pick a Snapping Turtle up by its tail; this could damage its spine. Once your turtle has made it across the road, snap a picture of it and report your sighting via iNaturalist.ca. For more information on CWF’s turtle work, visit HelpTheTurtles.ca! The Canadian Wildlife Federation (CWF) and Scales Nature Park found hundreds of dead turtles on roads around Muskoka and Ottawa this summer and are calling for more help to save these species at risk.